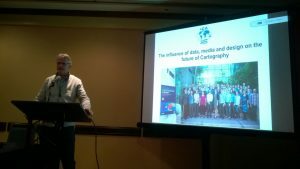 The ICA commissions on Cognitive Issues in Geographic Information Visualization, Visual Analytics, Map Design and Use, User, and Usability Issues are preparing a special issue for the International Journal of Cartography that will include multiple Research Agenda papers conceptualized around the general theme of ‘Envisioning the future of Cartographic Research’. As a result of the pre-ICC workshop in Curitiba last year, three main topics were selected: Research Methods in Cartography & Geovisualization; Designing across Human Abilities and Map Use Contexts; Representing & Interacting with Big Data. Each of these topics will be covered in a separate paper, drafts of which were recently given an early review by key ICA leaders (thank you to Muki Haklay, Alan MacEachren, Corné van Elzakker, Gennady Andrienko, Dan Montello) in February. 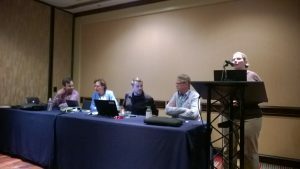 The next milestone took place at the AAG Annual Meeting in San Francisco where a meeting was organised to revise each agenda paper based on early review feedback. This session was attended (in person or virtually) by many of the associated co-authors. Furthermore, during a panel session at AAG, the structure and general contents of each draft paper was presented to receive additional input from the audience (Panel members: Menno-Jan Kraak(ICA president), Sara Fabrikant (CogViz; Vice president), Anthony Robinson (Visual Analytics), Robert Roth (UUUI) – Chair: Amy Griffin (CogViz)). All of this valuable feedback has been processed and the papers will be submitted in early Summer to the International Journal of Cartography for full review. The goal is to finish composing the special issue of IJC so that it can be published in the firs t volume of 2017. The associated ICA commissions will provide updates on their websites to promote this issue once it becomes available.